Meet John David Glaude. He's lost 160 pounds in the past couple years and he's got the leftover skin to prove it. John's built a decent following on his YouTube channel documenting his weight loss journey in a series of videos called "Obese To Beast". Tipping the scales at a high of 360lbs, John knew he needed to make some changes in order to get his weight under control and build the physique he wanted and knew he deserved. He started strength training, cleaned up his diet and has never looked back! He's documented his progress online and after an incredible amount of hard work and determination, has lost a ton of body fat and now walks around at a solid 200lbs. The only problem.. he still has all the skin of an overweight guy. When John was at his heaviest, his skin was stretched beyond its normal limits. And now that he's jacked and lean, he still has some areas of "loose skin". Since he's a pretty young guy, most of the skin should tighten up around his newly muscular frame but he'll probably need to get skin removal surgery down the road to clean up the areas where he carried the most amount of fat like his chest, tummy, arms and inner thighs. Loose skin is a major issue for people that lose a massive amount of weight. On the reality t.v. 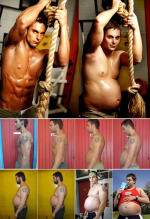 show "Extreme Weight Loss", successful contestants have skin removal surgery performed at the end of the year long weight loss journey as the final step in their transformation. In order to be a candidate for surgery, the contestants on the show must lose a certain % of their starting bodyweight. I'm sure this is something John will eventually look into getting done to help improve his self image and give him the confidence he needs to bust off his shirt and show the world the body he's worked so hard to get.